We use Australia Post Eparcel network as our main shipping partner. We do not ship to Locked Bag or Self Storage addresses. We only deliver to PO Box, Residential and Work addresses. SCM will not accept accountability for any lost, damaged, or stolen orders. We offer Free Click and Collect from any of our 3 convenient locations. More info. 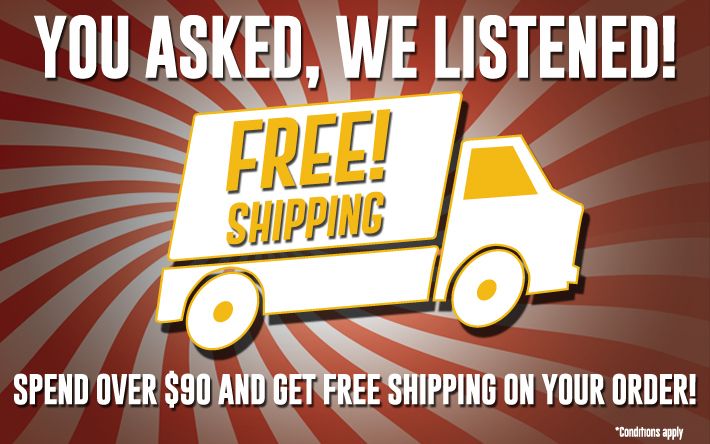 We deliver Free of Charge for orders with a value of or above $90 Australia wide. For any orders under $90 there is a flat shipping fee within Australia of $10. *Please note this rates exclude large or bulky items such as GIVI Top Boxes - Luggage and Tyres or a combination of bulky products. For more info relating to GIVI - Luggage - Bulky parcel orders, please visit the following page. For more info relating to Tyres, please visit the following page. We will contact you for additional shipping arrangements if needed only. You can always contact us for more information. The majority of in stock orders placed are processed and dispatched in 1-3 business days. Although we keep many items in stock, we cannot guarantee availability at all times. Items not currently in stock will need to be ordered in from our supplier (pending availability). I Would Like To Know If A Product Is In Stock? Please note delivery times may take longer depending on what state you live in and also due to any postal delays, You can get estimates using your tracking number. You, or someone at the delivery address at the time of delivery will have to sign for your order. If you are not available to sign for your order Australia Post will leave a note with instructions for pick up from a designated post office. Once your order has been picked, packed and processed we’ll send you an email with a tracking number which can be used at http://auspost.com.au/track/ to monitor the progress of your delivery. If you haven’t received a tracking number or have any concerns with your order, please give us a call on (02) 9330 9105 or send us an email. We’re here from 8.30am to 5.30pm weekdays (excluding public holidays) and are happy to help. Express Post is available at an additional cost on all items shipped within Australia. Please send us an email and we'll be able to provide you with a quote. We are sorry, we do not ship to locations outside of Australia.